Indian-American author Bharti Kirchner is known for exploring different genres through her prolific pen. With her newest offering, ‘Season of Sacrifice’, an intriguing new mystery series, she introduces Seattle-based nutritionist-turned–private investigator, Maya Mallick. ‘Season of Sacrifice’ makes for a compelling read, right from the unusual opening scene. The plot is suspenseful, face-paced and intricate. NRI Pulse caught up with Kirschner to discuss her new book, and her inspiration for creating a new mystery series. The ‘Season of Sacrifice’ begins with an unusual scene. During a morning stroll, feisty PI Maya Mallick is horrified to see two women set themselves ablaze in front of the temporary residence of the visiting Chinese foreign minister. An onlooker says that the two women are martyrs, protesting the Chinese occupation of Tibet. Was the plot inspired by a real-life event? Yes, although I wasn’t present there. When researching Indian history for a different book, I happened to come across a centuries-old story about young Indian freedom fighters. Some set themselves on fire in public to protest the British occupation. It was shocking to read about this to say the least. When I began writing Season of Sacrifice, I saw similarities with the Chinese oppression ofTibet. Then, too, I remembered reading about Tibetan activists sacrificing their lives in recent times. Hence the beginning. Tell us about Private Investigator Maya Mallick. Is she the first Indian-American private investigator? What is she like? I am not sure if Maya is the first Indian-American private investigator. However, she’s resourceful and observant and good with people. She’s studied criminology. In Season of Sacrifice, I present various communities inSeattle, such as Russian, Indian, and Tibetan. Maya can work with these communities. Her late father was a legendary detective in Kolkata. Maya works hard to live up to that reputation. 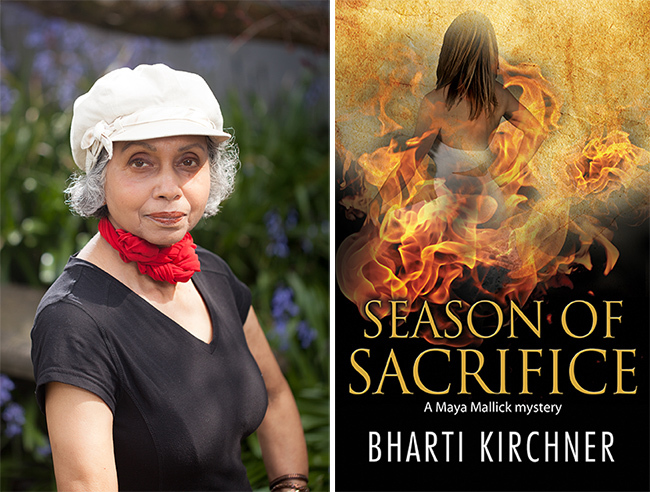 Season of Sacrifice is the first in the Maya Mallick series. What other mysteries can readers expect from Maya Mallick? I am now working on the sequel to Season of Sacrifice. It is titled Seasonal Disorder. The story—set in a remote island inIndiaand involving a bookish murder, with infidelity as one of its themes—is completely different, but there are a few recurring characters. One of them is Hank, Maya’s administrative assistant. The young short story writer, who is an able assistant, is generally loved by the readers. You have tried your hand at different genres of writing. What motivated you to get started on a mystery series? Ever since the publication of Tulip Season (a stand-alone mystery novel) in 2012, my fans/readers have been encouraging me to write more mystery. That was an incentive. I like the challenges of a new genre, although the process of breaking into it is anything but easy. You have to understand the conventions of a new genre; you have to read up on it. How is the writing process for a mystery novel different from, say, writing a historical novel? What are the challenges? Regardless of the category of the novel I am attempting, I don’t outline and I didn’t find the writing process to be any different. A historical novel requires a considerable amount of research. It requires that you immerse yourself in the period. There are a different set of challenges to writing a mystery. You’ll have to plant clues along the way. You’ll have to introduce twists and turns. But you’ll also have to be a step ahead of the readers in terms of figuring out who the real culprit is, keeping in mind that mystery readers are voracious and sophisticated. Then there are technical matters, such as forensics and police procedures, which involve both researching and interviewing professionals. You have tried your hand at mystery before with the ‘Tulip Season: A Mitra Basu Mystery’. How is Maya Mallick different from Mitra Basu? Although they’re about the same age, their personalities are different. Mitra is a garden designer, who relates well to the natural world. The flowers in her garden seem to speak of her emotions. Maya, on the other hand, likes the challenge of dealing with the gritty realities of life. Although she’s intuitive, she doesn’t depend on her intuition alone. She uses a rational, scientific approach in solving a crime. A career-oriented woman, she’s bent on making it as a homicide detective. Did you read mystery novels growing up? Were you influenced by your favorite mystery writers while writing this series? A child’ imagination is sparked by mystery novels and I devoured them when growing up. While writing this book, I tried not to read other mysteries as I didn’t want another voice in my head. That said good books inspire me, be it a mystery or a literary novel. I also find that the is the process of writing, pulling words out of the thin air, is an inspiration in itself.